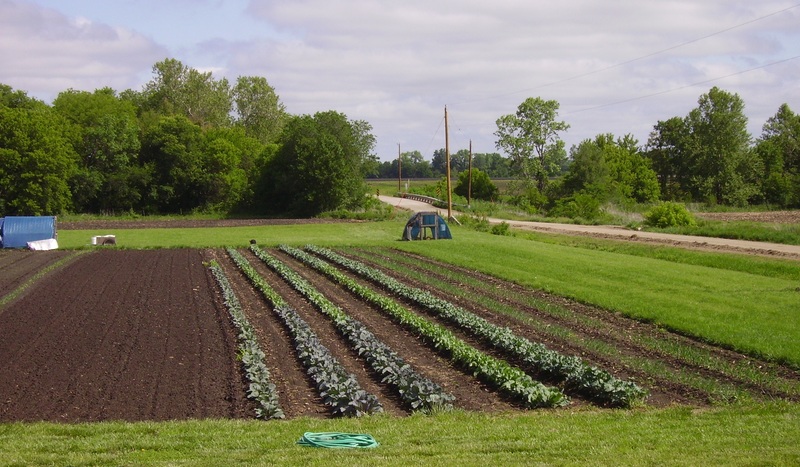 Located in the flint hills of east central Kansas, Shepherd’s Valley is a family-owned 90-acre diversified farm, featuring organically grown fruits, vegetables, and herbs, direct marketed to consumers through three seasonal CSA subscription share programs. The Spring CSA share runs 8 weeks from early April through May. The main season Summer CSA share runs 13 weeks from June through August. The Fall CSA share extends the season 8 more weeks from early September through October. Our Winter Green fresh salad greens and cold-hardy crops are available locally on an “as-we-have-it” basis. Hundreds of people eat from the gardens at Shepherd’s Valley every week during the growing season. We have been providing wholesome foods using chemical-free, biologically sound methods for over 35 years. We follow organic and sustainable principles in all aspects of farming. Shepherd’s Valley also raises pastured poultry including broilers, layer chickens, and turkeys. Customers tell us our broilers remind them of that old-fashioned chicken flavor they remember when they were kids – “just like Grandma used to serve.” Our pampered hens lay gorgeous brown eggs and specialty gourmet eggs that are a real treat – delighting bakers, chefs, and breakfast eaters. Heritage breeds and broad-breasted bronze turkeys are raised for the Thanksgiving table. Like all of our poultry, these big beautiful birds are raised on lush green pastures and fed certified organic grains and trace mineral supplements. No soy, vaccinations, antibiotics, hormones, pesticides, or medicated feeds are used in the production of our birds. Corriedale sheep and lambs provide our customers with premium table fare and beautiful handspinner quality wool. A growing number of handspinners are discovering our prize-winning wool fleeces. Our lambs are 100% naturally grown on Psalm 23 green pastures and hay. Everyone who tries our lamb meat comes back for more! A number of area chefs find no comparison equal to Shepherd’s Valley lamb. We source grass-fed beef and pastured pork from other Kansas area producers for our customers. These meats are usually available in late fall and early winter. As beekeepers for many years, we have been providing our customers with raw honey and bee pollen, as well as other value-added products such as locally produced jams and jellies. You do not have to be a member of the CSA to purchase farm products, however our shareholders receive first priority in purchasing surplus produce. Shepherd’s Valley is located northwest of Americus, Kansas. We are a 20-minute drive from Emporia, and an hour’s scenic drive from Topeka or Manhattan. If you would like further information about our farm, or would like to schedule a farm tour for your family or group, please contact us. Right now through sunday, one we have freedomshipping so order soon.